Following the recent announcements of shipyard closures in Portsmouth it is pertinent to explore the significance of Royal Navy shipbuilding in Britain. Although BAE Systems decided to retain its operations on the Clyde in November 2013, there was a fierce debate around whether it was Glasgow or Portsmouth who were best placed to emerge as the preferred builders of the Royal Navy’s new generation of aircraft carriers. 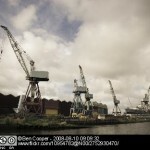 This article explores the history and significance of Scotland’s Upper Clyde shipyards and how local politicians and the Scottish press reacted to the news of the possible closures. Glasgow’s shipbuilding industry occupies a unique place in Scotland’s industrial heritage and maritime identity and, half a century after the initial decline of the Upper Clyde shipyards, the term “Clydebuilt” is still a byword for quality, precision and innovation. The industrial expansion of shipbuilding on the Clyde can be traced back to the mid nineteenth century. The city had already started building its industrial wealth on the tobacco and sugar industries of the late eighteenth century, but it was only when the Clyde Navigation Trust opened a navigation channel to the Upper Clyde in the early nineteenth century that shipbuilding began to flourish and Glasgow developed into a major Atlantic facing seaport. If Govan is the heart of shipbuilding on the Clyde, the father of the industry was marine engineer Robert Napier. Napier built his reputation on the construction of innovative steamship engines throughout the 1830’s and was able to bring considerable investment to the Clyde. Many of the shipbuilders apprenticed to Napier went on to establish the upper Clyde’s most successful and iconic shipyards, including John Elder who founded the Fairfield Shipbuilding and Engineering Company at Govan in 1886. By the late 19th century the Clyde shipyards were building the most sophisticated and technologically innovative iron and steel ships in the world. The Fairfield yard flourished under the chairmanship of William Pearce, an English shipwright and naval architect who had learned his trade at Chatham Dockyard in Kent. The Govan yard prospered constructing steam ships and ocean liners, and later naval vessels. As the ship building industry expanded, the villages around the banks of the Clyde became increasingly urbanised; the population of Govan increased from around 2000 in the early nineteenth century to 9000 in 1864, when the town became a burgh. Upper Clyde shipbuilding reached its height in the early years of the twentieth century in the run up to the First World War. At its peak, 70,000 workers were employed in nineteen shipyards along the Clyde and by 1907 the population of Govan had exploded to 95,000. The Clyde yards were still providing the Royal Navy with the most sophisticated war ships in the world, but by 1910 the shipyards and the communities that supported them, around Govan and Clydebank in particular, were becoming increasingly militant and radicalised. This political radicalisation, dubbed Red Clydeside by the press, arose from a number of ideological, political and social causes including increasing opposition to what was seen as an imperialist war, labour unrest, poor housing, falling wages and rising rents. A number of charismatic figures emerged from the loose amalgamation of organisations and workers committees including the pacifist Marxist John McLean and Communist trade union activist Willie Gallachar of the Clyde Workers Committee, both of whom were imprisoned under the Defence of the Realm Act between 1815 and 1816 for criticising the war effort. Despite this political radicalism and opposition to the First World War, the Upper Clyde remained an important centre of naval shipbuilding between the two wars and the shipyards, particularly those at Clydebank, were heavily bombed during the Second World War. Following the war from the 1950s onwards, the Clyde shipbuilding industry started to decline rapidly as the yards were no longer able to keep pace with more competitive foreign shipbuilders. Industrial relations on the Clyde degenerated throughout the 1960s, leading to frequent strikes and industrial action. The Upper Clyde yards were increasingly seen as troublesome, uneconomic and uncompetitive, and by 1965 Fairfield shipyard in Govan was placed in the hands of the receivers. 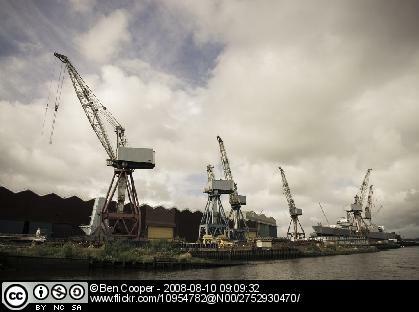 The UK government responded to this industrial crisis by amalgamating the five remaining shipyards, including Fairfield, to form Upper Clyde Shipbuilders in 1968. Just three years later in 1971, with the shipyards continuing to run at a loss, UCS went into receivership. The Conservative government refused to bail out the yards, forcing the company into liquidation, despite a full order book. In response to the government’s decision the Clyde shipyard unions, opted for industrial action. However instead of striking, the union, led by a group of Communist shop stewards including Jimmy Reid, decided to prove the industry’s viability by keeping the yards open through a staged work-in. The protest received enormous public sympathy and popular support both locally and nationally and in 1972 the government revoked its decision and restructured the upper Clyde shipbuilding industry into two yards; Govan Shipbuilders and Yarrow Shipbuilders. Both yards were sold in the 1980s through the Conservative government’s privatisation programme. Govan Shipbuilders was bought first by Norwegian engineering and construction company Kvaerner and subsequently by BAE Systems in 1999. The Govan shipyard is now owned by BAE Systems Maritime – Naval Ships, a subsidiary of BAE Systems, specialising in building naval surface ships and integrating combat systems. In recent years, the River Clyde has undergone a period of substantial regeneration and redevelopment with leisure, cultural and creative industries, including digital media, replacing the heavy industries of the previous century. However shipbuilding remains an important part of Govan’s social and community identity. The launch to a new ship is still a significant local event, which is traditionally attended by children from the neighbouring schools. The recent news that BAE Systems planned to close Portsmouth shipyard with the loss of 940 jobs, and to cut a further 835 jobs at Govan and Scotstoun yards on the Clyde, has brought the issue of Britain’s maritime history and it’s place in contemporary urban identity very much to the fore. The issue of independence, and whether the 2014 Scottish referendum influenced the decision to retain Govan as the United Kingdom’s remaining naval shipyard, coloured the debate north and south of the border, particularly with regard to whether Scotland could continue to build warships for the Royal Navy if it split from the UK. 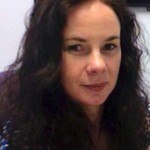 The party political debate has rapidly become heated with accusations of jobs being held to ransom for political ends. Underlying the political ramifications of the decision, a more nuanced narrative is evident that highlights the unique place of the shipyards in the social and cultural identify of the two cities as perceived by the national press. 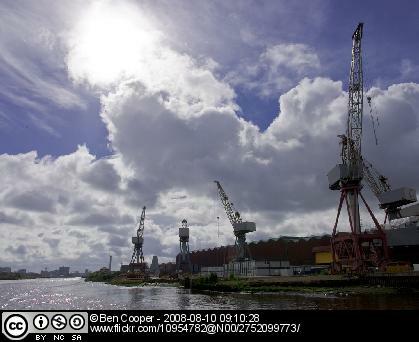 Although only a tiny proportion of Glasgow’s workforce is now employed by the Upper Clyde shipyards, it is clear that for many, the yards are of central importance to their identity as workers, as Glaswegians and as Scots, and that any threat to the remaining shipyards and their iconic structures, is a threat not just to the industry and the community but to the body politic of the city and the maritime industrial identity of its people. “D-Day for the shipyards: 835workers set to go in Glasgow and Rosyth as BAE Systems announces 1775 job losses”, Daily Record, Wednesday 6 November 2013. D. Leask, and S. Paterson, “Fears over Govan yard as cranes removed”, HeraldScotland, Saturday 2 November 2013. “BAE Systems: Reaction to shipyard job losses”, BBC News, Wednesday 6 November 2013. “D-Day for the shipyards”, Daily Record, Wednesday 6 November 2013. T. Crichton and D. Clegg, “Thousand of Scots shipyard workers begin nerve-shredding wait to learn if they have a future on the Clyde”, Daily Record, Wednesday 6 November 2013. Crichton and Clegg, “Thousand of Scots”, Daily Record, Wednesday 6 November 2013. “Jobs fear at Govan and Scotstoun as BAE prepares to slash 1000 jobs”, HeraldScotland, Tuesday 5 November 2013. Leask, and Paterson, “Fears over Govan”, HeraldScotland, Saturday 2 November 2013. H. Yousaf, “Shipyards under the spotlight and MSPs must help the workers”, Glasgow Now, Wednesday 13 November. I am researching my ancestor Thomas Blackwood who owned Blackwood & Gordon shipbuilders from Port Glasgow ( and previously Paisley). I am interested in locating any information about him or his family and am particularly keen to find a picture of him. There are plenty of photos of his ships but I have yet to find one of the man himself. He died in 1891.